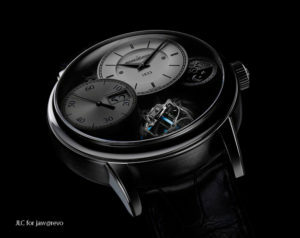 The 2013 Jaeger-LeCoultre Grande Tradition Gyrotourbillon 3 Jubilee – The Hybris Mechanica Of Haute Horlogerie. This is the 180 years of Jaeger-LeCoultre since Antoine LeCoultre set up the Grande Maison in 1833 at a small town in Valee de Joux – Le Sentier. To commemorate this important anniversary, Jaeger-LeCoultre again rocks the haute horlogerie world with the state-of-the-art Grande Tradition Gyrotourbillon 3 Jubilee, years ahead of its competitors in terms of horological achievements. 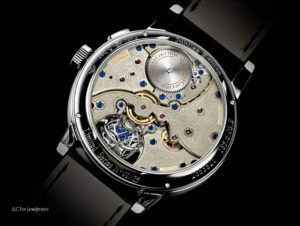 Exceptional sapphire caseback view of the Grande Tradition Gyrotourbillon 3. Note the unique hand finishing where the patterns are decorated one by one. The elegance and the technicality of the original multi axis Jaeger-LeCoultre gyrotourbillon 1 and Reverso Gyrotourbillon 2 are still unsurpassed today but Jaeger-LeCoultre has not rested its laurels and gives us a new breakthrough in their latest technical salvo. 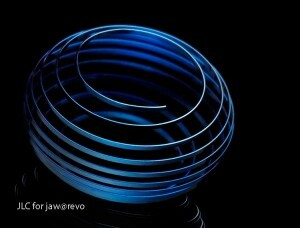 The heated blued spherical tourbillon used in the Jaeger-LeCoultre Grande Tradition Gyrotourbillon . 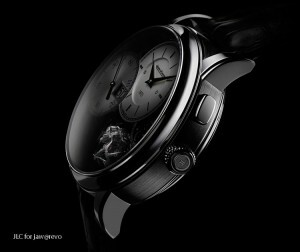 This is the first time a spherical hairspring is used in wristwatch. 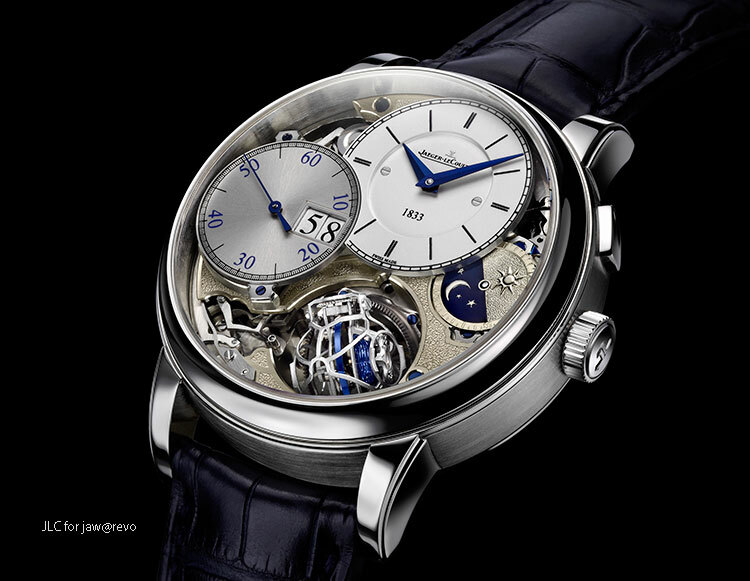 For the very first time in wristwatch history, a carefully constructed spherical hairspring is used in a wristwatch and more, it also incorporates a monopusher chronograph with instantaneous jumping digital minute window. The stunning Jaeger-LeCoultre Grande Tradition Gyrotourbillon 3. Available individually or as a set of 3 timepieces in the Jubilee collection (together with Jaeger-LeCoultre Master Grande Tradition Tourbillon Cylindrique a Quantieme Perpetual Jubilee and the Jaeger-LeCoultre Ultra Thin Jubilee), this is possibly the most desired timepiece for the sophisticated technical watch collectors. 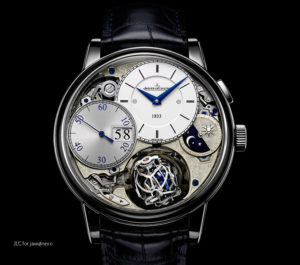 The Jubilee box set of 3 watches will carry the same serial number and allocation of the limited 75 pieces of Jaeger-LeCoultre Grande Tradition Gyrotourbillon 3 will give priorities to the box set buyers over the single watch purchase. In an exclusive private presentation of the box set to top Jaeger-LeCoultre international VIP Grande Complication clients just a few days before the SIHH, customers have expressed strong interest and quite an impressive number of confirmed orders have been placed with some eager to obtain their preferred serial numbers. Together with an impressive range of product this year, this technical tour-de-force from Jaeger-LeCoultre will further entrench the brand’s leadership position in the field of technical innovations. This looks like another great year for Jaeger-LeCoultre!